ProjectManager.com provides everything you need to plan, schedule, execute and track your projects and your teams in real time. Our powerful PM software offers real-time dashboards, online file storage, interactive Gantt charts, scheduling tools, role-based access authorization and more. Find out how we can improve your project success rate with this free 30-day trial. When it comes to project success, effective project management tools are just as essential as the methodologies, team members and the stakeholders with whom you work. Equipping yourself and your team with the best tools available can turn your thorough plan into an amazing project, where every deliverable and milestone are met. ProjectManager.com is the only project management software that gives you the means to plan, manage, track and report on every phase of your project. 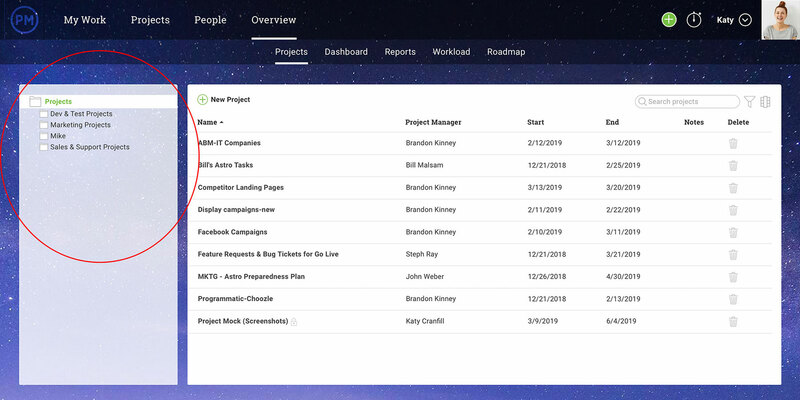 Our online project management tools provide visibility into every task and team member, with up-to-the-second updates and live data feeds for unrivaled awareness. We provide project managers with the knowledge they need to make the critical decisions that drive projects to successful conclusions. If you’re a project manager who’s ready to achieve more and move beyond the status quo, then read on to learn how our cloud-based project management software can streamline your workflow and help you deliver more projects on time and under budget. Stay on top of every detail with our most popular management tool: real-time project dashboards. Customize your view to see your most important metrics at a glance and gain quick insights into all aspect of the project. Get live looks at task progress, team workload, expenses, slippage and more. Everything is displayed in easy-to-read, color-coded charts that make data analysis fast and simple. Pull the information you need to make impactful decisions when you use our intuitive reporting tools. Get in-depth, yet visually appealing, reports on anything and everything including expenses, task progress, timesheets and issues and more. After you’ve made your reports, you can share them online or print them out to disseminate project communications. With easy access to live and historical data, you’ll be able to set your projects up for predictable success. 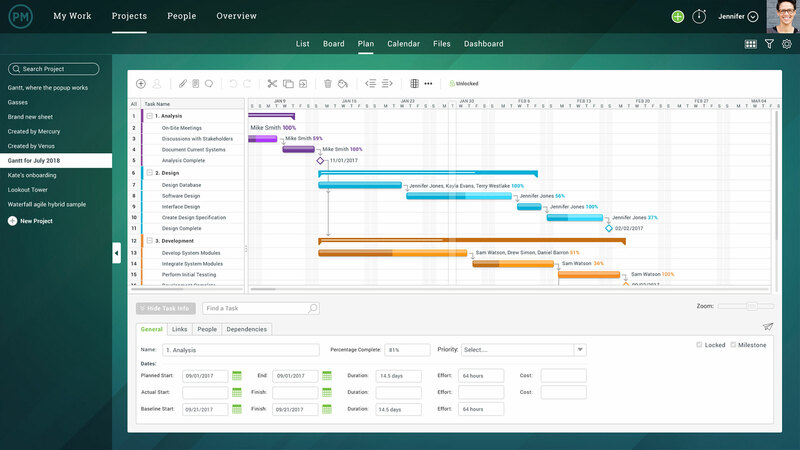 Get the most out of your project planning skills with our sophisticated Gantt chart tools. Use everything you know to establish baselines, create critical paths, link tasks, set milestones and more. You can even add custom columns for total customization and complete control of your Gantt chart. If you need to update a task or deadline, simply drag and drop the timeline. Plus, You can update tasks with notes and file attachments directly in the chart view. Our Gantt charts also allow you to import files from Word, Excel and Microsoft Project in case you need to continue an old project or examine a colleague’s work. No Gantt chart software gives you more features. 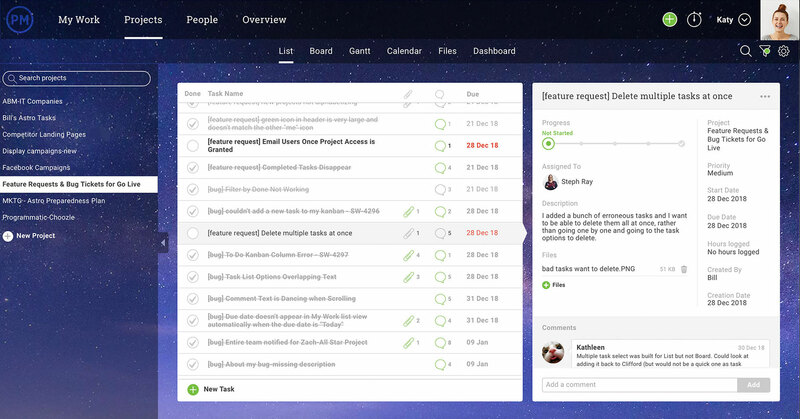 ProjectManager.com offers software to help managers and their teams get more done together. Assign and schedule your team’s tasks with our commanding task management tools that let you sort and prioritize. View task progress and track hours worked, and even add comments and files. Switch over to our calendar to schedule meetings, reminders, deadlines for deliverables and more. Plus, our calendar syncs with your email so notifications and alerts are sent to your inbox. Schedule and track workload with our visual workload management tools. With one clear view you can see how workload is distributed across your team, and you can even schedule PTO and holidays. If one team member is overloaded, easily re-assign work to another team member in the very same view. Unlike Microsoft Project, ProjectManager.com makes it easy to collaborate online with your team whenever you need to. This provides a central forum for answering project questions and disseminating project communications. Plus, as team members update their task progress, you’ll receive emails informing you of their headway, granting greater visibility into the project. For peace of mind when collaborating, we feature role-based access restrictions. Everyone on your team is assigned a role, and you can easily restrict what information they can view in the software. Once it’s set up, it’s easy to share stats and updates in a controlled environment. Manage your project portfolio with all the robust features we’ve already mentioned. Use our PPM Gantt charts to link tasks across multiple projects in a portfolio. 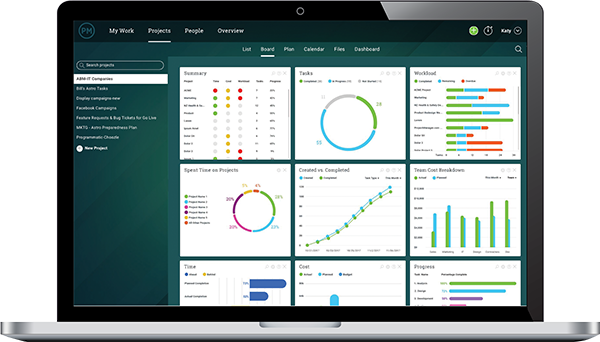 Set up PPM dashboards and use our project portfolio reporting tools to track progress across several projects. With ProjectManager.com, you can manage any number of projects with accuracy and efficiency. 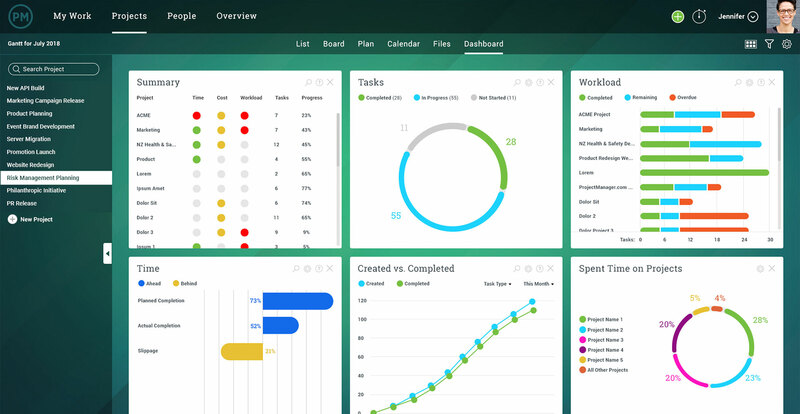 ProjectManager.com is the perfect blend of familiar project management tools like Microsoft Project, and modern cloud-based management tools with collaboration features. Our online interface offers an all-in-one solution with everything from online document storage, to task management, to project portfolio management. Find out how ProjectManager.com can improve your project management with this free 30-day trial. See why over 10,000 global teams use our online PM tools to get more work done on time and under budget.